Pumpkin Chocolate Bread filled with delicious Milk Chocolate disks and a perfect breakfast or dessert! This recipe comes together in just a few minutes and doesn’t need a mixer to make your house smell like Fall is here! Look at those chocolate disks with molten centers! Not going to lie, it isn’t even October yet and I am already feeling pumpkin obsessed! I am a lover of the holiday season. Every year I go all out as soon as Labor Day passes and I stay completely on board with the “wow that lady really just loves the holidays” until the end of the year. Then I am completely burnt out and I don’t want to even think about the holidays again until April. It works out pretty well for me, the only things in between are my birthday in January and Valentine’s Day in February, both of which I officially am off duty for. If you hop on board the crazy holiday lady train with me we will be making stops for Halloween, Thanksgiving, Hanukkah, Christmas and New Years! We’re a Christmakkuh family around here thanks to Seth Cohen and The OC (You should totally google that video, Seth Cohen is awesome). In fact my oldest is already asking for Moshe and Elfie (her Mensch on a Bench and Elf on a Shelf). They hide around the house wreaking havoc together. We even totally break the rules because both Moshe and Elfie get nightly hugs and kisses before everyone heads to bed for the evening and the scavenger hunt starts up again the next day. So buckle your seatbelt (which if you are anything like me will feel a bit tighter by the new year) and get on board the holiday train. It is full of delicious baked goods, decadent party treats and almost nothing light or healthy until January! (I kid, I kid, there will be healthy things too!). 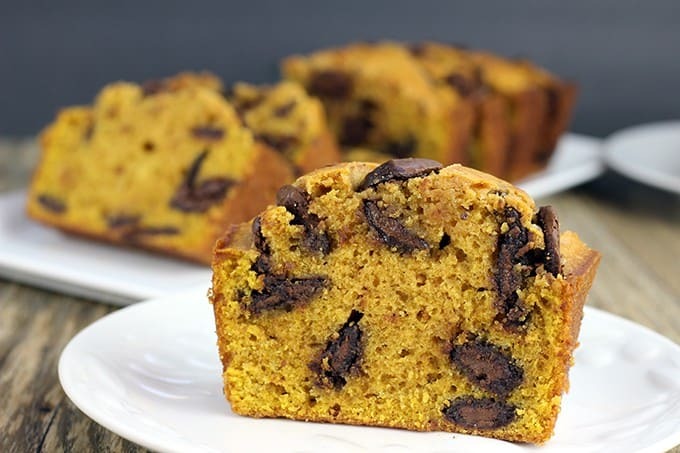 This Pumpkin Chocolate Bread is not light or healthy but it is absolutely delicious! I use the chocolate disks in the recipe to add a dramatic flair and to have that molten chocolate middle of the disks while the outside stays crunchy. It is a great textural element to the dish you’ll love. Plus my other favorite thing about this recipe is NO STAND MIXER! That means I don’t have to ask my loving husband to bring it onto the kitchen island for me or to wash it! 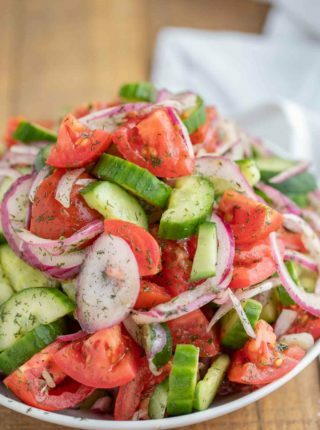 A whisk is all you need for this easy recipe! Spray a 7×3 loaf pan with baking spray or cover in butter and dust with flour. 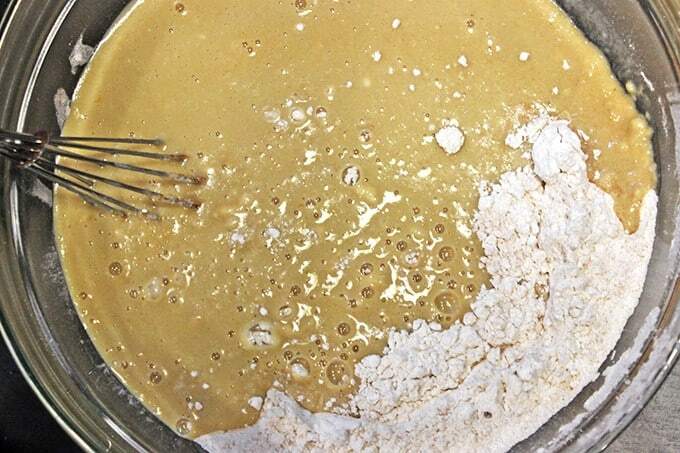 Mix together pumpkin puree, eggs, oil, water and sugar until well blended with a whisk. Add the dry ingredients to the wet ones and whisk until just combined. Pour into prepared loaf pan. Press the chocolate disks halfway into the batter. Bake for 55-60 minutes, or until a toothpick comes out clean. Pumpkin Chocolate Bread filled with delicious Milk Chocolate disks and a perfect breakfast or dessert! This recipe comes together in just a few minutes and doesn't need a mixer to make your house smell like Fall is here! Look at those chocolate disks with molten centers! Spray a 7x3 loaf pan with baking spray or cover in butter and dust with flour. 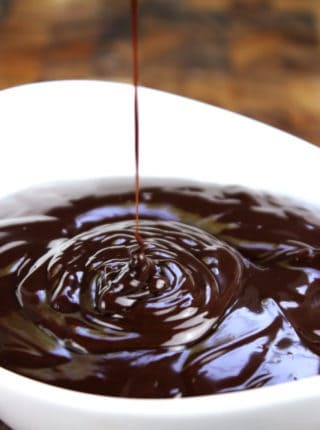 In a separate bowl add the rest of the ingredients except for the chocolate disks and whisk together. Press the chocolate disks halfway into the batter. Bake for 55-60 minutes, or until a toothpick comes out clean. Absolutely delicious. I did not have the disks but I found the morsels worked very well. If you have more than one recipe for pumpkin bread this will be the one you will want to use. Thanks for the 5 stars Mary! No this recipe uses cooked pureed pumpkin or a can of prepared pumpkin puree. Blending raw pumpkin won’t work. I just made some pumpkin bread without chocolate b/c my honey doesn’t like it. But I’m all about the chocolate, I’ll have to come over to your place for this amazigness ! yum ! This is such an easy recipe and it has to taste fantastic because… well, because pumpkin AND chocolate! What a yummy combo! And I love how you used the chocolate disks! I am also a crazy holiday lady too! Thanks! I am a total sucker for the holidays. I have already started moving furniture around to make room for a giant 10ft tree! This looks amazing! Love the chocolate pumpkin combination! i lovee pastries made with pumkin. cake, cookies, bread and this looks amazing. i know i would totally love these. thanks for the share. Whoa!! Chocolate disks. LOVE that idea. I haven’t made anything pumpkin yet this fall. I am totally off my game. This might be the first thing. This bread would be gone in a flash with my kids! Thanks! It definitely didn’t last long in our house! Oh I am notorious for doing that too! I make “Thanksgiving” dinners all year! Yum. My mom used to make something like this. Used to be my favorite fall recipe. 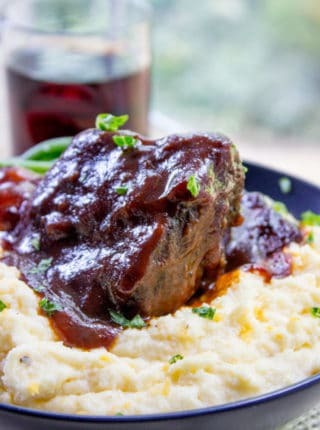 Aww I love coming across recipes that remind me of my mom’s cooking! I love pumpkin bread. I have never tried it with chocolate in it before. This looks so delicious. I think my family would love it. Awesome! I hope your family loves it! 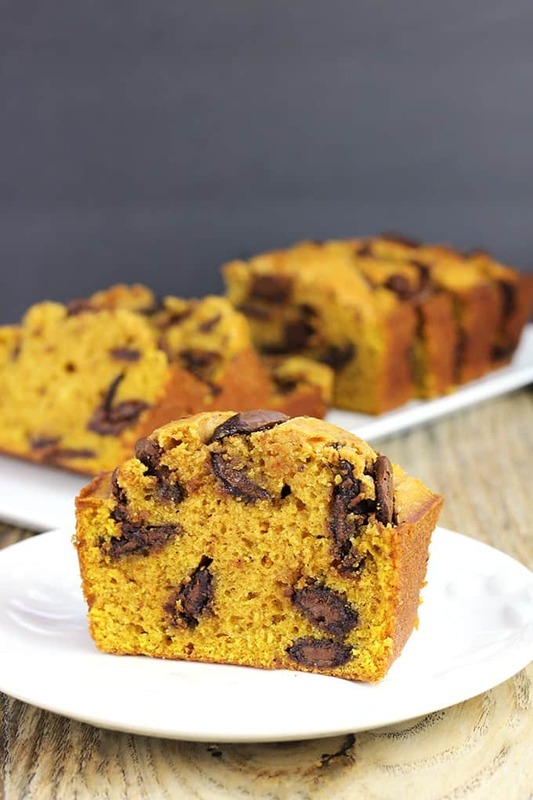 My kids would love to try Pumpkin Chocolate Bread. It looks easy to make. I will have to give it a try. 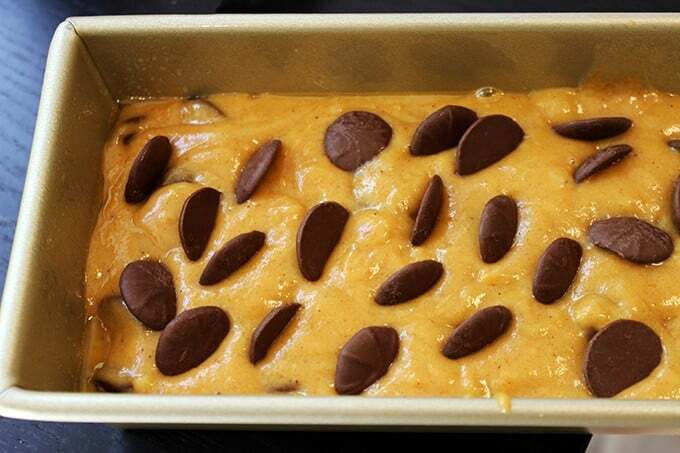 Pumpkin Chocolate Bread looks so delicious. I will have to add this recipe to my bake list for this Sunday. I love the idea of using chocolate disks instead of chips to make the bread. I love Pumpkin and always get so excited for it to come back out in the fall! Oh yes the discs are awesome! I love using them. I try to make as much as I can with them instead of chips. 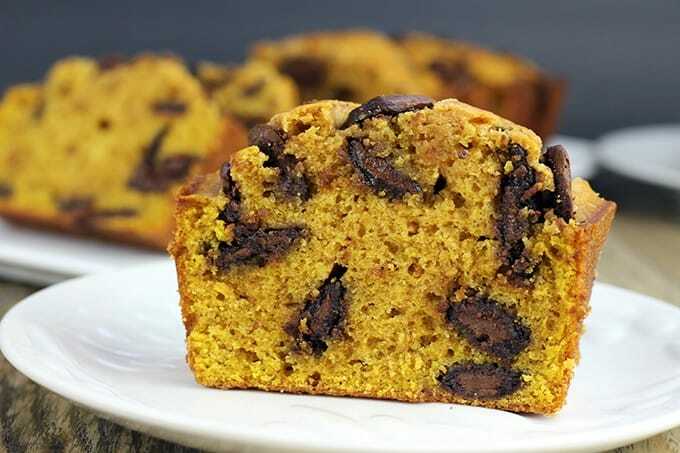 This pumpkin chocolate bread sounds and looks delicious! I would have never thought to combine the deliciousness of both pumpkin and chocolate together! Yum! These are two of my favorite flavors in one delicious-sounding dessert. Awesome! I hope you try it and love it! I am not much for pumpkin flavors except for bread. Adding the chocolate makes me want to try it even more. I mean what doesn’t taste better with chocolate? That looks so good! One of my favorite things to do is put chocolate chips in breads like this. I can’t wait to give this recipe a try. Hope you love it Stacie! 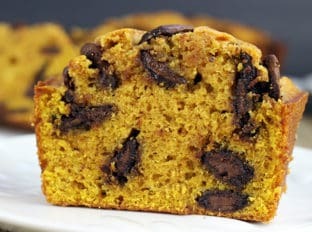 I love pumpkin bread, especially with chocolate chips. I make similar muffins but the bread would be a great diy gift. Yes! It would be a great gift! This looks so yummy! 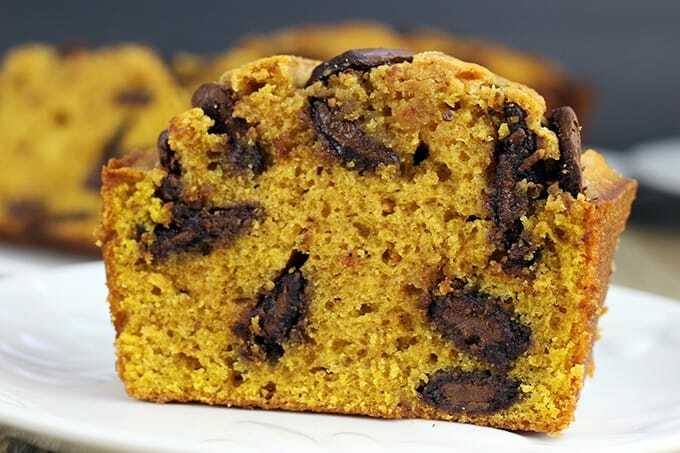 Pumpkin chocolate chip bread is one of my favorites in the fall so I’ll have to try this! Fabulous! Fab – u – lous! I’m all about pumpkin everything this time of year, and when you throw in chocolate chips, it’s super awesome! My entire family would eat these so fast I wouldn’t have time to take pictures! That is the best part of this time of year, anything pumpkin!! 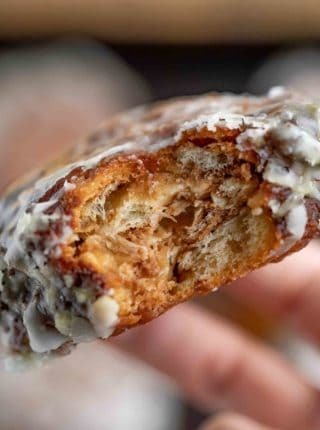 Oh man, this would go sooooo good with my cup of coffee right about now. 😉 Looks wonderful! I’m doing exactly that as we speak! haha. This looks amazing! Perfect for fall! OMG look at those chocolate discs! They look insanely good, you are right this can make the perfect breakfast or dessert, or even, the best snack ever! I know right, those disks totally upped the game of this pumpkin bread! I totally took the slice with that had the most in it, haha. Pumpkin & chocolate! This is the perfect bread for fall! Love it!